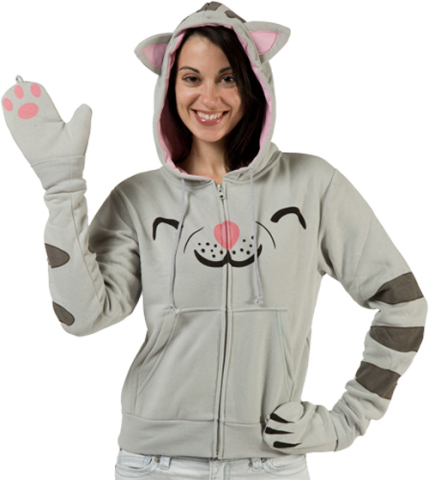 This Soft Kitty Hoodie Is The Cat's Meow! kitty, little ball of fur. . ." This cute kitty hoodie, inspired and licensed by the hit television show The Big Bang Theory, will make you the happy and warm kitty. It's just purrrrrrrfect! This full-zip jacket is made of a comfy cotton/polyester blend and has two kangaroos-style pockets. To make sure that you get the full kitty experience it also comes with ears, tail, and fully detachable paw mittens. Comes in unisex and ladies versions. Sizes S through XL, size XXL coming soon. For more information or to order, click here. "Happy kitty, sleepy kitty, purr, purr, purr." It's good to be the nerd.